I do like the Kaleidoscope House figures but wish they had more poseability. I have turned to primarily using action figures for my miniature displays because they are more modern, diverse and tend to be much more realistic. I've had some disappointments with the occasional figure because there is this growing trend in the action figure industry where although the figure boasts 42 points of articulation, it's all in the neck of the figure and it is more a statue than "action". 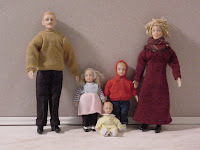 Maybe someday someone will get it right and make modern dollhouse figures that look like the people we actually see in life. I've made changes to the inadequate families you mention. I restyle their hair, remove clothes and redesign. Simply making their StarTrek-like pullovers into cardigans helps. When arms are too stiff, I use ragland to disguise; for the staring eyes, I fashion sunglasses using pieces of old-fashioned film. author of "Murder in Miniature"
What dollhouse-family manufacturers offer are literally the same people from 1980. And other than FP's Loving Family -- which is really 1:10 -- there are no Asians or Hispanics. What gives? The problem is even worse in half-scale, where manufacturers think we all want non-posable resin in quaintly Victorian attire.